With your keyboard on, let's take another look at the MAIN screen. You've seen the DEMOs and you may have watched some videos. And, in the next lesson, we'll take a look at the voices in your keyboard and how you can select them and play them. Of course, if you are just learning to play, it may be a while before you start showing off your songs on your new keyboard. But you can still show off some songs because your keyboard includes some preset songs that are always there and ready for you to play. Notice the selection next to your [A] button. For all of these keyboards, the first cell will say NewSong and this is where you can select a "SONG" to play. You see the word "SONG" in the upper right-hand corner of that cell. The initial Tyros3 screen is shown below. On the Tyros3, you would select a "STYLE" by using the [D] button and a "MULTIPAD" by using the [E] button. The actual cell placement may differ on your model. For example, on the PSR-S950 and S910, you select the STYLE with the [E] button. On all the keyboards, you select the first right-hand voice with the "F" button and the second right-hand voice with the "G" button. (More on selecting voices in the next lesson). Right now, let's take a look at that "SONG" button. The expression "NewSong" means no song is currently loaded and you can create a new song if you want. To "load" a song that is stored in your keyboard, simply press that [A] button and you open up the SONG screen (see below). This screen will display several tabs at the top of the screen. The first tab is always "PRESET", which is selected in the figure below. The other three tabs are "USER", "HD1", and "USB1". The "HD1" is only available on the Tyros models and it represents the Tyros hard drive. The "USB1" tab is only visible if you have plugged a USB drive into your keyboard. These are the four areas where you can store files. Files in the PRESET area are permanently stored in the keyboard hardware. The Tyros models can have an internal hard drive and that is indicated by the "HD1" label. If you have a USB flash drive connected, files there would be found under the "USB1" tab. Remember, that you would use the "TAB" buttons to the right of the display screen to move back and forth from one tab to another. In the PRESET area of the Tyros3, there is one folder stored. It is called "SampleSongs". You can tell it is a folder because of the folder icon shown in the illustration. Folders can contain files and/or additional folders. To select that folder and see what is in it, you would once more push the [A] button because that folder is listed right next to the [A] button. When you "open" that folder, you see the available preset songs stored in your keyboard. 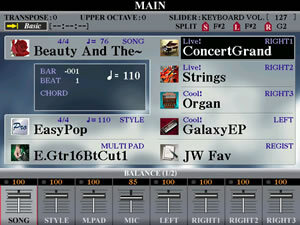 The songs available in the Tyros3 are shown in the second screen shot above. To select a particular song, press the button next to that song. When you press the button, the song title will be highlighted (white letters on a dark background). Press the various buttons to see how you can select any of the songs. To return to the MAIN screen, push the EXIT button. If you double-click a button, that is, push it twice quickly, that will serve to both select the song and return you to the MAIN screen. The screen shown here has the song "Beauty And The Beast" selected and loaded into the SONG cell. Additional information about that song is also shown in that cell. The tempo of the song is shown as 76 (bpm) and the time signature is 4/4. 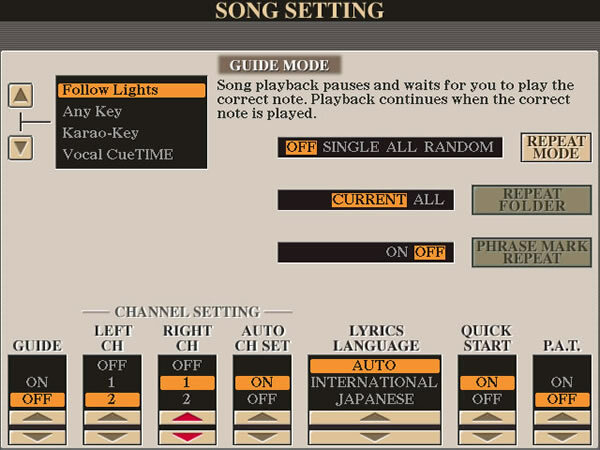 To "play" the song, you will use a group of control buttons labeled "SONG" located to the left of the main screen. The "SONG" buttons let you record your own songs, but we'll save that discussion for later. They also let you load and play midi songs. All the keyboards have a set of buttons that look like those shown below. The buttons are labeled and may also have symbols indicating what the button does. To hear the song performed, press the PLAY/PAUSE button and your selected song will start playing. Of course, pressing the button again will "pause" the song. To stop the song, press the STOP button. The REW button is for rewinding the song back to the beginning and FF for moving fast forward. When you are ready to record your own songs, you'll use that REC button. You do not have to return to the MAIN screen to play your song. You can select the song in the song selection screen and press the PLAY/PAUSE button to hear the song. You can stop that song and select another song and start it playing. This way, you can try out all those preset songs. On the mid-level keyboards, you also see a SONG SELECT button. Pressing this button is the same as going to the MAIN screen and pressing the [A] button next to the SONG cell -- it takes you right to the SONG display screen where you can select your song. The Tyros3/4/5 models do not have a SONG SELECT button. Instead they have four buttons labeled I, II, III, and IV. The "I" button is the same as the SONG SELECT button on the mid-level keyboards. The Tyros models allow you to create your own song storage areas (the II, III, and IV buttons) that hold specific songs stored anywhere on your keyboard (USER, USB, or HD). You could, for example, select a folder of songs in one of your storage areas and then use the MEMORY button (use alternate view of the SONG display) in conjunction with one of these song storage areas to "store" the folder reference in that area. Then, when you pressed the relevant button, for example, II, it would go immediately to the folder that you had memorized for that button and show you the songs available in that folder. Another useful button in the SONG area is labeled SCORE. 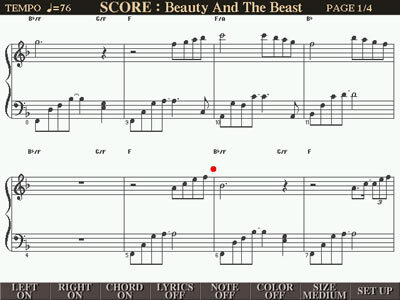 While you are listening to a midi song, press the SCORE button to bring up a display of the musical score for the song. As the song plays, the score will move along with the music. The registrations at the bottom of the screen allow you to select various options for how the score will be displayed. For example, you may turn the display of the left hand (bass lines) on or off. You can choose to display the chords or hide them. If a song has lyrics, you can show them or hide them, etc. The LYRICS button will show you the lyrics of a song, IF those lyrics are included in the midi file. Not all midi files include the lyrics. This button may be labeled KARAOKE on some keyboards. 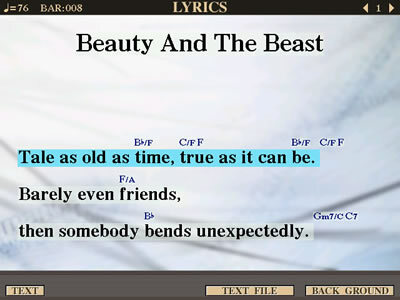 As the song plays, the LYRICS screen highlights the words that go with the melody. If your keyboard happens to have a video out jack, the LYRCIS screen can be shown on a larger monitor and thus facilitate group sing-a-longs. If you have a PSR-3000 or a Tyros2, you will have a button in the SONG control section labeled "Performance Assistant" or PAT. This feature is also available in later keyboards, but the button disappeared and the PAT feature has to be launched by stepping through various screens to get to the option ([FUNCTION] - [SONG SETTING] - [PAT] On/Off). This option screen from the Tyros3 looks a bit intimidating. But it does show some features you may want to use including that P.A.T. feature (no longer even labeled as "Performance Assistant.") If you are new to keyboards and not very accomplished at reading music, this PAT feature will, nonetheless, allow you to amaze your friends with your playing ability. When you turn the PAT feature on, then, as a midi file is playing, you can press any keys at all on the keyboard and the Yamaha arranger will adjust the notes so that they go along with whatever song is playing. You can pick any voice and hit any notes, it will all sound great! Another useful option on this page is the REPEAT MODE. By default it is OFF, but you can set it to one of the other options. If you set it to ALL, then when you start playing a song in a particular folder, when the song finishes, the keyboard will simply move on to the next song in the list. In this section, I just wanted to introduce you to the preset songs that are built into your keyboard so we won't cover all the various options under SONG SETTING. But, since the PAT feature can be fun for "aspiring" musicians, I thought it might be useful to introduce it here. Now, let's go on and look at all the wonderful voices YOU can play on your keyboard. This page updated on February 10, 2015 .